Police respond very quickly to mass shootings, and bigger magazines means more deaths. As Washington gears up for the big Senate floor debate on gun control, two disturbing reports about the mass shootings in Tucson and Newtown have underscored the urgent need for a ban on assault weapons and semi-automatic magazines. True, it seems unlikely that the Senate will pass a ban on either: Dianne Feinstein’s bill, which would ban at minimum 157 semiautomatic weapons and magazines that carry more than ten bullets, will not be included in the big gun control package the body will take up next week. Senate Majority Leader Harry Reid says there are not even forty votes to pass Feinstein’s bill, though it will come up for a vote as an amendment. About two hours later, he had apparently used some of that ammunition, emptying a 33-round magazine in about 19 seconds, and killing, among others, a federal judge and a 9-year-old girl and seriously wounding Ms. Giffords, who was shot in the head at close range. That’s an astounding amount of carnage for nineteen seconds. The documents indicate police officers arrived only “moments” after the shooting, and bystanders already had Loughner pinned down—yet, he was able to shoot nineteen people. 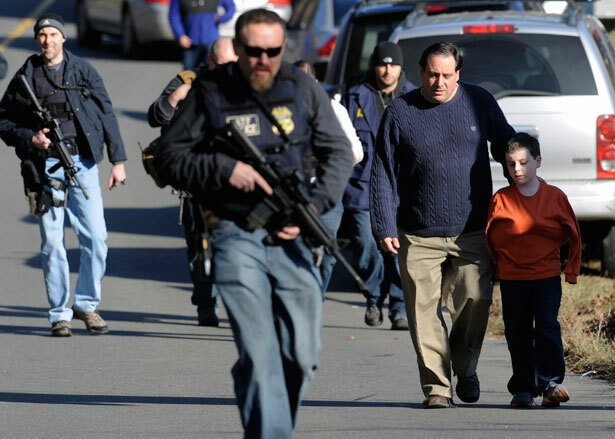 On Thursday, extended police reports from the Newtown shooting were released, and contained similarly shocking numbers: Adam Lanza fired 154 rounds in the 300 seconds before police arrived, killing twenty children and six adults. That’s one shot for every two seconds, but they no doubt came faster: that 300 seconds includes the time it took Lanza to move around throughout the building. Both the Bushmaster rifle and the high-capacity magazines would be banned under Feinstein’s bill. Recall, too, that in Aurora, James Holmes shot seventy-one people in ninety seconds—even though his gun jammed. The grim shots-to-seconds ratio underscores some basic facts: police officers respond remarkably quickly to mass shootings, and the more quickly the gunman can fire bullets, the more people die. Even a brief pause for reloading—which would also enable bystanders to attempt to restrain the shooter—means some lives are likely spared. Some well-meaning arguments against the assault weapons and high-capacity magazine bans assert that they aren’t responsible for a very large percentage of gun crime, but that’s a misdirection: The issue is that, when they are used in a crime, the carnage is disproportionately bad. And bans do work: A Washington Post analysis earlier this year found that during the last assault weapons ban, “the percentage of firearms equipped with high-capacity magazines seized by police agencies in Virginia dropped, only to rise sharply once the restrictions were lifted in 2004.” They’re now double what they were in 2004. Also, researchers at the University of Pennsylvania found that the use of assault weapons in crime dropped by about two-thirds nine years after the ban was enacted. Sadly, it’s probably certain that there will be another mass shooting in America. If the shooter is using high-capacity magazines, it’s just as certain that more people will die than otherwise would even with a normal gun. Senators should keep that in mind next week. Read George Zornick on a new government study that calls for the military to crack down on sexual assaults within its ranks.